Former Telecom Minister Dayanidhi Maran was quizzed by CBI for second consecutive day in connection with the alleged use of over 770 high capacity Bharat Sanchar Nigam Limited data lines at his three residences in Chennai and Delhi. Central Bureau of Investigation Special Task Force officials, who had questioned Maran for nearly seven hours at the agency headquarters on Wednesday, began his examination again on Thursday on the leasing of telephone lines, which has been termed by Home Ministry as threat to national security. 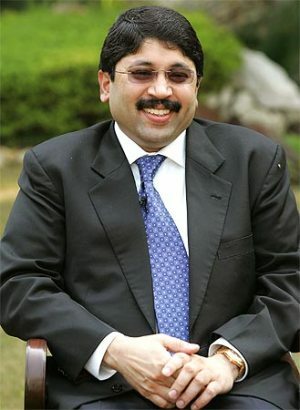 Maran had already been questioned in connection with the case in January and October 2014, while his brother Kalanithi was examined once in September last year. It is alleged that a loss of over Rs 1.8 crore (Rs 18 million) was caused to the exchequer by use of such large number of high capacity ISDN lines at Maran's Boat House Road residence in Chennai. The residence was allegedly turned into a ‘virtual telephone exchange’ to facilitate speedy transmission of programmes by Sun TV owned by Maran's brother Kalanithi. The questioning comes on a day when reports suggest that Information and Broadcasting Minister Arun Jaitley may take up the case of Sun TV with Prime Minister Narendra Modi after the Union Home Ministry rejected a proposal for granting security clearance to the television network. Sun TV had approached the Home Ministry for security clearance and its case was supported by Information and Broadcasting Ministry. However, the Home Ministry declined to give clearance, saying the owners of the TV network were facing cases for various offences including money laundering.